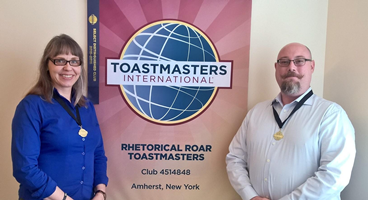 AMHERST, N.Y. –- Daemen College staff members Dr. Michael Berta and Dr. Hella Jacob, members of the college’s Rhetorical Roar Toastmasters Club, have each received top honors at a Toastmasters International Speech Contest hosted Sept. 16 on campus. This marks the third consecutive time participants from Daemen have won a local Toastmaster contest. With these wins, they will move on to the next level to compete against top winners from four other Buffalo Niagara Toastmasters clubs at an area event being hosted on Oct. 7 by the Buffalo Psychiatric Center’s Toastmasters chapter. Berta, director of educational development, won in the Evaluation Contest category for his assessment of a speech given by Eva Miller of Rochester. This is the second time Berta, a Cheektowaga resident, has won in this category. In the Humorous Speech Contest category, Jacob, project assistant in the Center for Excellence in Teaching and Learning, won for her speech on parenting. She resides in Amherst.